To date, I haven't gotten to any of the suggested six titles. I figured since we're already in June I'd better get crackin' as Shonya gave me a whooper of a selection (see below) and that read is going to take some time. I figured I'd best start out this challenge with an easy read so I picked up Harriet the Spy . This title was suggested by Cassandra at Adventist Homemaker. I was able to find a copy of it dirt cheap at our local library book sale so I had it on hand wen I was ready to finally pick it up and read it. As is typical for me, I do not bother finding out anything about a storyline before I sit down to read a book. I try not to learn as much as possible so that I can be surprised by the read. My initial impression of the book was that Harriet was a sleuth in the same way that Nancy Drew was and so I was in for a fun middle grade mystery. Boy, was I wrong! 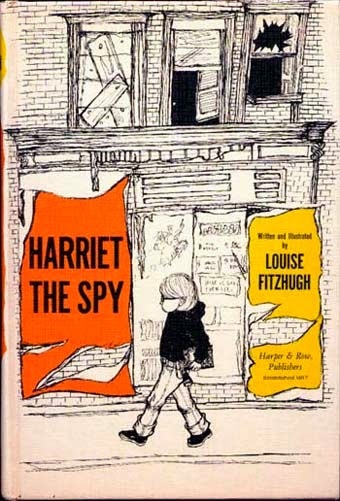 I'm sure that everyone else out there has read Harriet and already knows that she's not a sleuth that anyone admires - she's a self proclaimed "spy" who is really a sixth grade brat busy body. When you meet Harriet, you are introduced to a young girl who enjoys prowling about her neighborhood and listening in on conversations that she has no business hearing. She sneaks up on people's roofs and looks down skylights; she sneaks into other people's kitchens and rides around in their dumbwaiter to listen in as people talk in their bedrooms. Worse still, she has a horrid opinion of everyone she comes into contact with and she writes her rather vicious thoughts down into a notebook. Perhaps even more horrid (in my opinion) is the fact that she pretends she's best friends with a couple of kids at school but in her private notebook she lists all of the things about them that she despises them for. Truly, I began to despise Harriet and was wondering why on earth she's remained such a popular character. She's a loathsome creature. Then, finally, in the last few chapters of this incredibly achy read, Harriet is made to see a fatal flaw in her behavior and she apologies to her friends. I think I was supposed to feel satisfied at this point but I didn't feel that way at all. The way she comes to realize her prideful arrogance is to be convinced by an adult she respected that it's ok to write her thoughts down but just to make sure not to share them with others. However, if someone were to ever find out her secret, private thoughts, it was ok to offer a "little white lie" to smooth things over with her then broken relationship. Harriet's way of apologizing for all of the nasty things she says about her classmates and friends is to publish a small paragraph in the school paper offering an anonymous "general apology" for the things she said that were "not true". She doesn't go into specifics and she doesn't name herself and so the apology falls very flat on its face for me and I quite possibly liked Harriet less at the end of the book than at the beginning. Lucky for Harriet, her friends take her back and the book is concluded with her thinking that her apology returned things to normal so now she can get back to her spy work. I closed the book remarkably glad to be done with it. I have no use for bratty little girls who go about hiding in places they shouldn't be, listening to things that they should not hear, screaming at adults whenever she thinks that a tantrum will get her what she wants, and who offers insincere apologies just so that she can feel moderately stable in her relationships. There is no real confession of sin here, just a "tidying up" to get her to a place of personal comfort and rest while totally disregarding the hurt feelings of anyone and everyone else around her. I'm less than impressed. Here's the major reason for my objection. All in all, with a bit of regret towards Cassandra (will you still be my friend? ), I have to give Harriet two thumbs down. I have no interest in reading her ever again or in having my kids read her except as a lesson in How to Not Behave in Every Area of Your Life. Bah! 2. It only took me one day to read it. So there you go. Book one from my personal reading challenge crossed off the list! Which other titles are on this list of six books selected by others for me to read in 2014? Twelve hundred pages of Atlas Shrugged , by Ayn Rand. Suggested by Shonya at Learning How Much I Don't Know. Redwall , by Brian Jacques. Suggested by Stephanie at Simple Things. Quiet: The Power of Introverts in a World That Can't Stop Talking , by Susan Cain. Suggested by Amber. 7: An Experimental Mutiny Against Excess , by Jen Hatmaker. Suggested by Stephanie at Everyday Family Living. Redwall is on my (hopeful)summer reading list. I'd never heard of that particular Hatmaker book, but it went on my list, too! We're working hard toward minimalism, so that looks like some perfect encouragement. I think you'll like Quiet...a whole lot. I would have had the same assumptions about the book. Sounds annoying. Harriet has always been a favorite of mine. I felt sorry for her because Ole Golly left, her parents seemed unavailable and I loved checking in on the neighbors she spied upon. I always worried that she'd get caught. I wonder...if I'd read it first as an adult would I have felt the same as you? PS- As usual, I did NOT like the movie adaptation. Sorry! I read Harriet as a young child and was fascinated by her because she was a writer and because she tried so hard to be observant. My family traveled a lot, so my brother and I would play "spy" when we were staying at various places. It was a game that required imagination, observation, and satisfied my incessant need for writing. Like make.share.give, I might not have felt the same if I had read Harriet for the first time as an adult. I'll agree that some things are only enjoyed as a child (like my husband's insistence that Labyrinth is a good movie *ahem* NOT). Anyways, thanks for giving her a try! So sorry that you disliked the book so much! It was amusing to read your commentary. Thank you for sharing your opinion on this book. I'm afraid when I read it a few years ago I couldn't finish it. I love mysteries and stories about kids, but I did not like "Harriet" at all. Of the rest of the books listed I've only read Redwall. Two of my sons love all the Redwall books and so do I.
I will concede that this might not be the best year for you to tackle it with Bookworm 4 newly home (AND The Brothers Karamazov coming this summer! ), but you simply *must* read it sometime because I want to read your thoughts. I didn't love everything about it, but it was well-written AND it really made me think. I'm not a Harriet the Spy fan either. I never read Harriet as a child, but we saw a movie that was based on the book a few years back, and I was shocked in the same way you were that this was considered a classic and recommended reading for children. I didn't see anything to admire about Harriet. I think I have that Leif Enger book on my very long TBR list. Atlas Shrugged is humongous. I never thought it looked interesting enough to tackle, but I'll look forward to your thoughts on it. I enjoyed Quiet very much. I read Harriet when it first came out (yes, I'm old) and I LOVED it. As I grew up an only child, things got boring and I remember packing up a spy kit and I would sit under an end table in our living room listening to my parents chat when I got home from work. Of course I wrote it all down and I wish I still had what I wrote!! I eventually tired of the boring adult talk and went back to my books in my room. LOL!